John Downie is a traditional white-blossom crab-apple, and one of the most popular for making crab apple jelly. The fruits are a very attractive bright orange-red, with a distinctive upside-down pear shape. Please fill in the details below and we will let you know when Malus John Downie crab apple trees are back in stock. 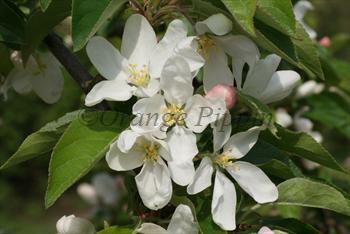 Malus John Downie is in flowering group 4. Malus John Downie is self-fertile and does not need a pollination partner, although fruiting may be improved if there is a compatible tree of a different variety nearby. 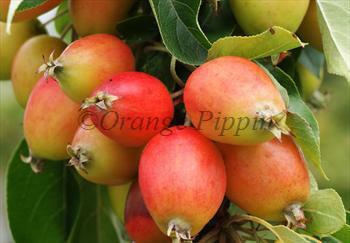 John Downie is not as disease resistant as most other crab apple varieties - but still easy to grow. It grows in a more upright style than most crab apple varieties.